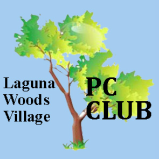 This page contains archived material from our club presentations and meetings and announcements ​for the benefit of our membership. ​Over time, these links may become unavailable. Orange County public library card and their online library username and password. The access through the Orange County website home page is complicated. It is recommended that you use the direct link above. The Orange County Public Library Laguna Woods Branch is located in the lobby of the Laguna Woods City Hall. 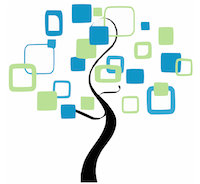 The branch is attended from 10:00 a.m. until 4:30 p.m., Monday through Friday. During those hours, you can register for a library card, pick up or return materials, pay library fines and fees, and receive assistance using computers to search for information. ​Call or visit the library if you need assistance. Do you still want to use social media? Here's what you need to know!! ​Scroll down to see all pages (3 ) of the information. The FTC takes in reports from consumers about problems they experience in the market place. 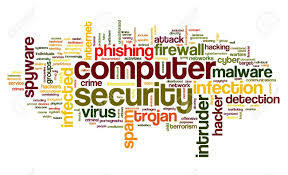 The reports are stored in the Consumer Sentinel Network (Sentinel), a secure on line data base available only to law enforcement. While the FTC does not intervene in individual consumer disputes, its law enforcement partners–whether they are down the street, across the nation, or around the world–can use information in the data base to spot trends, identify questionable business practices and targets, and enforce the law. Since 1997, Sentinel has collected tens of millions of reports from consumers about fraud, identity theft, and other consumer protection topics. During 2017, Sentinel received nearly 2.7 million consumer reports, which the FTC has sorted into 30 top categories. Attend the FREE conference from the convenience of your own home! All you need is your computer, tablet, etc. and Internet access. The sessions are 50 minutes in length and offer attendees the opportunity to ask questions via Q&A; the questions are answered by the presenter at the end of the presentation or via e-mail if there isn’t enough time after the presentation. APCUG uses ZOOM for the VTC webinar presentations (www.zoom.us). If you have not participated in a VTC, go to https://zoom.us/download to download the app for the device you will be using to ‘attend’ the conference. You should also make sure you have the latest version of Zoom on your device. Videos from earlier conferences can be found on APCUG’s YouTube channel (www.youtube.com/apcugvideos). Spread the word by forwarding this e-mail to your members. VTCs are a great way for them to expand their technology experience and be introduced to new skills. Below are the sessions that are currently scheduled. Learn to use the tools that make visiting the Internet safe and enjoyable. It really isn’t important what you use to get to the Internet. How do we keep the curious and the devious from seeing our activity while using the Internet? We all have critical information like passwords and account logins that we don't want to be known, some info we consider private, or we simply don't want anything to be seen by others because it's nobody's business. It's our data, our conversations, and only those we grant permission should see that data. You may have heard that your web surfing and emails could be vulnerable to snooping. It may be easier than most people know, especially when using public Wi-Fi! We'll discuss the best way to help make your data unreadable and untraceable - by implementing VPN. Anyone in public... Free/Paid Wi-Fi at coffee shops, restaurants, libraries, hotels, etc. iOS 11 has many more custom options than usual and many of them are first-rate. Jere will show us how to tailor some of these options to meet our needs. Free software - it’s all about sharing. John (otherwise known as Free-John) will be sharing the flagship productivity suite called LibreOffice. This piece of software has all the components (and a couple extras) that another major software company has, that is widely used in business. He will take us on a hands-on tour of the different sub-programs LibreOffice has and hopefully you discover a free program that has all the features you would need in a productivity suite. Stats – 1B users; 1.2B photos uploaded each day. And, it’s FREE. It’s like a shoebox full of photos but you can easily find a specific photo. Since we now take most of our photos with our phone, it’s designed for mobile first but can also be used with our computer. It’s easy-to-use with unlimited storage. Do you need a backup strategy? How to sync them? Who can see my photos? How do they get archived after death? All these topics and more will be covered in Ron’s presentation. As well as a hands-on demo. What’s new in technology? First it was the Cloud and now it’s Voice Operated Assistants = the future is here! Voice operated assistants like Amazon Echo, Dot and Tap and Google Home are here to help us with automated tasks and more. Siri, Cortana, and Google Assistant also help us with our technology. How about the dark side? 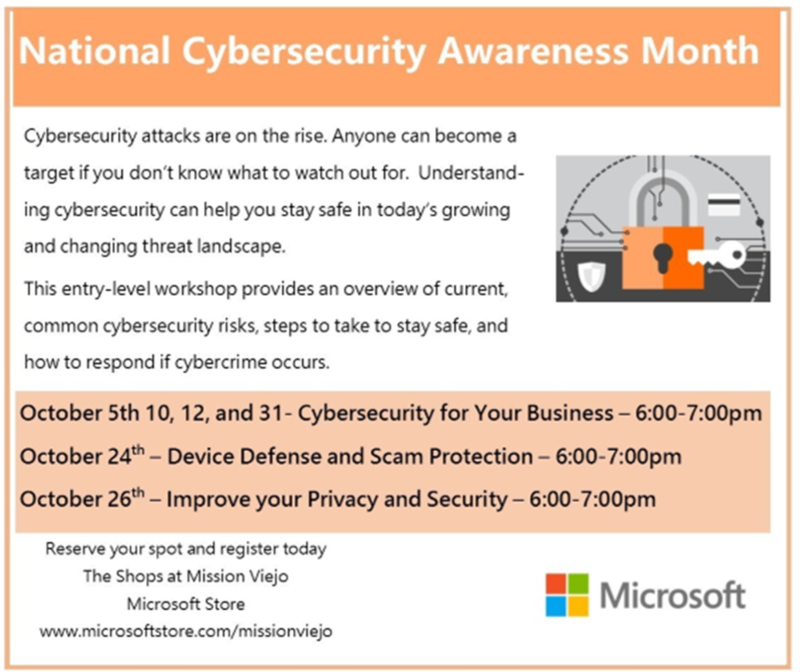 Microsoft in Mission Viejo has invited you to participate. Register Now - Classes are filling up. ​Privacy or Security - Are they the same? Potpourri Night - Something for Everyone! To review the information, please click on the link below.